The project also aims to instil rugby values in children in some selected schools. Through the ‘studs in the mud’ project, she has been able to buy 18 pairs of brand new firm ground rugby boots using money donated by individual donors including rugby fans, friends and family. As part of her outreach to give back to society, Zainab has donated some of that equipment to the Kanda Cluster of Government School and the Aggrey Memorial International Schools located in the capital city of Accra. The post UK Based Ghanaian Female Rugby Player Supports Ghana Rugby At Grassroots Level appeared first on DailyGuide Network. TWO ENGLISH Premier League clubs, Arsenal and Chelsea, have made it to the semifinals round of the UEFA Europa League. Arsenal won 1-0 away from home at Napoli, progressing to the semifinals on a 3-0 aggregate. 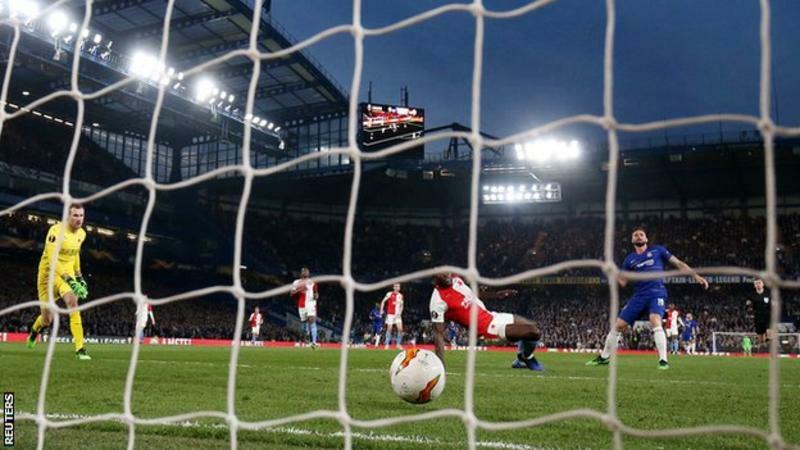 Chelsea qualified on a 5-3 aggregate after winning home 4-3 to Slavia Prague. The Gunners are to face Spanish La Liga side, FC Valencia while the Blues would take on Eintract Frankfurt. Both Arsenal and Chelsea have a slimmer chance of qualifying for next season’s Champions League through the Premiership as they keep falling from the top four spots on the league table. That means one of them has to win the Europa title at all cost to be sure of next season’s Champions League qualification. The post Chelsea, Arsenal Into Europa Semis appeared first on DailyGuide Network. 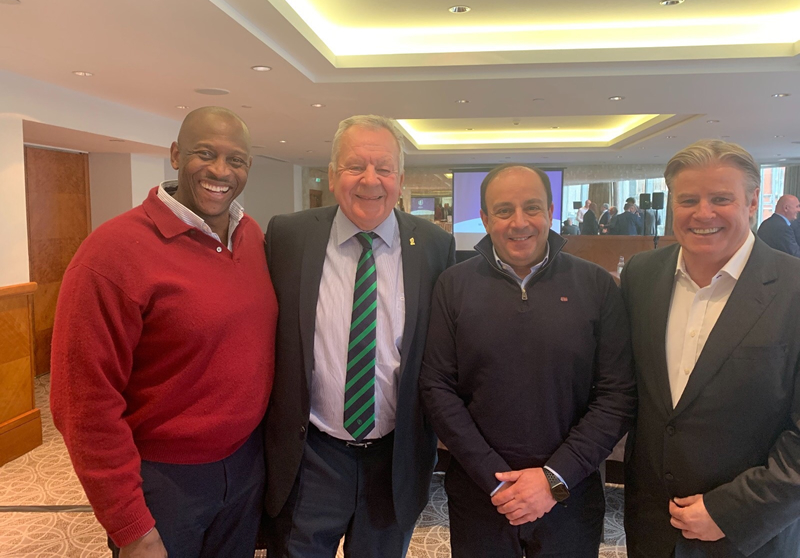 Mr. Herbert Mensah, President of the Ghana Rugby Union and member of the Executive Committee of Rugby Africa, World Rugby President Sir Bill Beaumont, Rugby Africa President Khaled Babbou, and World Rugby Director. The President of Rugby Africa, Mr. Khaled Babbou, attended meetings in London on the 16th of April, with his counterpart from Rugby Europe, Mr. Octavian Morariu, and members of World Rugby to discuss the project of a World Rugby Nations Championship and its implications for Tier 2 and Tier 3 countries. Mr. Babbou, accompanied by the President of Ghana Rugby and Member of the Rugby Africa EXCO, Mr. Herbert Mensah, met with the President of World Rugby, Sir Bill Beaumont and the CEO of World Rugby, Mr. Brett Gosper, David Carrigy and other World Rugby executives ahead of the meeting on the World Rugby Nations Championship. The discussions touched on the future of Rugby in Africa, its immense potential and the strategies to keep growing the game in Africa and improving performance at the same time. According to Mr. Babbou, the encounter was a good platform to give his vision for the growth and development of Rugby in Africa as well as the challenges to Mr. Beaumont and Mr. Gosper, and to touch base on the shared mission and vision of both rugby bodies to grow the global rugby family and to make it a sport for all, true to its values of integrity, passion, solidarity, discipline and respect. “As one of the fastest growing Regional Associations of World Rugby, the meeting served to confirm Rugby Africa’s commitment to grow and develop rugby on the African continent with its huge untapped potential despite the challenges it is facing,” Babbou said. Mr. Herbert Mensah was invited to join the Rugby Africa EXCO in Marrakesh, Morocco, at its 13th General Assembly to contribute his experience in building commercial value for Rugby Africa. Both Babbou and Mensah believe the major challenge is and will be to establish sustainable funding for the development and tournament programmes of Rugby Africa as well as funding that will go beyond that to support its high-performance Unions to excel once it enters the global stage of Rugby. The post Future Of Rugby In Africa Discussed At A Meeting Of Presidents In London appeared first on DailyGuide Network. Following discussions between the Ministry of Youth and Sports and the Ghana Gas company Limited, the latter has agreed to refurbish the Theodosia Okoh National hockey pitch in Accra. Aside that, Ghana Gas is also prepared to construct four (4) additional pitches at the major public universities in the country. Hon. Isaac Kwame Asiamah yesterday. Dr. Asante explained that these interventions form part of Ghana Gas’ corporate social responsibilities and were arrived at after discussions with the sector Minister in his pursuit to overhaul the country’s sports infrastructure. He also commended the Minister for his massive contribution to the growth and promotion of sports since his appointment by the President H.E Nana Addo Dankwa Akufo Addo. The Minister for Youth and Sports, Hon. Isaac Kwame Asiamah expressed his gratitude to the management of Ghana Gas for coming on board to complement his vision of changing and improving the phase of sports facilities in the country. The Minister observed that the renovation and construction of sports infrastructures will go a long way to expand the frontiers of sports and other recreational activities in the country. With the country currently preparing to host the 2023 African Games, the Minister stated that the provision of additional sporting facilities will make a strong case for our preparedness to host the rest of the continent come 2023 and further rank Ghana as one of the suitable countries to host any sporting event of any magnitude. The post Ghana Gas To Renovate Theodosia Okoh Hockey Pitch appeared first on DailyGuide Network. The committee tasked to mediate in the Ghana Athletics Association (GAA) impasse on Monday presented its report to the Director General of the National Sports Authority (NSA), Prof. Peter Twumasi. The three-member committee chaired by Prof. Menyeh was assigned the role of finding a solution to the impasse that has delayed the GAA’s congress, as well as make recommendations to serve as a guide for the association’s future operations. And presenting the report to the NSA boss at its Accra office, the committee chairman pointed out that hearing the two aggrieved parties informed its outcomes and recommendations. It recommended that persons nominated for more than one position should be informed about it to settle on one, after which a publication be effected by the secretary general for delegates to become fully aware of persons running for the various positions. The committee proposed that ex-presidents or chairmen can be made ordinary members without voting rights but that will be subject to Congress approval. And to the committee chairman, it will give due recognition to past officials and also allow for them to bring on board their experience for the further development of athletics. It also advised that the secretary general should send members’ minutes of the general assembly few days before congress. The committee called on the GAA to fix the election date for not less than a month from the date the parties reach an agreement and have terms of settlement entered in court. The NSA boss commended the committee members for completing the work ahead of the GAA’s next appearance in court on April 29. Richard Quarshie and Akua Pokuaa Kwarteng supported Prof. Menyeh as members. The post NSA Receives Aboagye- Menyeh Report appeared first on DailyGuide Network. Managing Director of Geoyan Enterprise, dealers in cornmill, concrete mixer and hardware, George Yaw Nkansah, says all is set for the Geoyan-Kwahuman health walk this Saturday. Participants are expected to meet at the Obo Central Market at 5:00am, and it will start from Nkawkaw to Nyarkoa Ba Nyarko Royal Hotel. “All is set for the event; it is another opportune time to stretch, burn calories and network. We have been working all year, and so we decided to put this together to promote health awareness,” Yaw Nkansah said in an interview. “We want to inculcate the habit of regular exercise in society, so we are urging all Kwahuman and all those coming for the Easter festivities to join in the exercise. It’s going to be fun. We have arranged for health screening and refreshment,” he added. The event has received support by way of sponsorship from Geoyan Enterprise, SP Mineral Water Nkawkaw, East Cantonment Pharmacy, Bedita Pharmacy, Nyarkoa Ba Nyarko Royal Hotel and Renie Chemist. The post Geoyan Health Walk Rocks Kwahu appeared first on DailyGuide Network. Bechem United U-17 on Monday began their quest for glory in Dallas rightly when they recorded an emphatic 5-0 win over their counterparts, The Sports Factory Academy (TSF). Hope Avayevu Kodzo opened the scoring with a spot kick, had another disallowed and later added two more, after which Michael Ankomah-Bempong and a superb free-kick from Razak Abubakar made it five. “It’s a great feeling to score three goals. I thank my teammates and the coaches for their good work,” Hope Avayevu Kodzo added. Victor Asante, who was judged man of the match, attributed his feat to team work. He thanked God and called for Ghanaians to support the team. The team faced Solar South from Texas yesterday, but the result was not available at press time. The post Bechem Demolish Sports Factory appeared first on DailyGuide Network. Senegal international goalkeeper Khadim Ndiaye has suffered a double leg break after colliding with his teammate during a Champions League clash for club side Horoya AC against Wydad Casablanca and will miss this summer’s the African Nations Cup. Ndiaye, 34, who started all three of Senegal’s matches at the 2018 World Cup, suffered the horrific injury during the second leg of the quarterfinal, where his side were beaten 5-0 to crash out of the competition following a 0-0 draw in the first leg. “The results [of the surgery] concerning our goalkeeper are reassuring,” a post on the club’s Instagram page read. “No open fracture. Ndiaye is set to miss six to nine months. The post Senegal Keeper Suffers Leg Break appeared first on DailyGuide Network. TWO SUPERB goals from Argentina’s soccer star, Lionel Messi, on Tuesday night against Manchester United, helped La Liga giant, FC Barcelona to progress to the semin-finals of the UEFA Champions League. Messi opened the scoreline against the English Premier League side on the 16th minute of the first half. Four minutes later, he doubled the score, increasing his Champions League goals for this season to 10. After suffering a 1-0 home defeat in the first leg played on Old Trafford, Man United was down 3-0 aggregate in the first half of the second leg, making their chances of progressing to the semifinals an elusive venture. Brazilian international, P. Coutinho worsened the case for Ole Gunnar Solskjaer’s Man United side when he increased the Camp Nou scoreline to 3-0 on the 61th minute. Man United succeeded in performing magic in Paris against PSG in the second leg of the round of 16 but Camp Nou was a no magic ground for the English side as the Talisman, Messi, inspired a convincing victory for Barcelona. Barcelona would face either Liverpool or FC Porto in the semifinals. In Italy, Portuguese’s international, Cristiano Ronaldo had his dream of reaching the Champions League final with Juventus brought to a sad end as Dutch side,Ajax defeated Juve 2-1, progressing to the semifinals on an aggregate of 3-2. Ronaldo, a five-time winner of the Champions League, gave Juventus the lead from a first-half corner on the 28th minute. But Ajax leveled, thanks to a goal from Donny van de Beek who controlled Hakim Ziyech’s shot and slotted past Wojciech Szczesny on the 34th minute. Ziyech came close to doubling the scoreline for Ajax shortly after the break before De Ligt, up from the back, scored a decisive, powerful header. The away-goals rule left Juventus needing two in the remaining 23 minutes. However, it could have been more comfortable for the Dutch team in the closing stages with David Neres shooting wide and Ziyech flagged offside after whipping a smart shot into the top corner. The post Messi Crashes Man Utd; Ajax Stops Ronaldo appeared first on DailyGuide Network. Ole Gunnar Solskjaer insists he does not believe in fate, but admits “sometimes things are meant to be” as he gets ready to return to the Nou Camp this week. Twenty years on from his dramatic injury-time winner in Barcelona that sealed Manchester United‘s treble, Solskjaer is hoping to mastermind another comeback. The United squad, including former boss Sir Alex Ferguson and chief executive David Gill, arrived at Manchester airport on Monday morning having earlier driven into training. They fly out to Spain at midday before a press-conference at the ground, followed by training on the pitch. Nemanja Matic and Alexis Sanchez are set to travel, but it is unlikely that Ander Herrera will feature. They arrived at Carrington training ground on Monday morning ahead of making their way to the airport ahead of catching the flight. On returning to the scene of the final in 1999, where he and Teddy Sheringham swung the game in injury time, Solskajer admits to ESPN: “I don’t believe in fate but I do believe that you get what you deserve. “Sometimes things are meant to be if you really go it. “I’m not the type to think: “This makes me proud.” I will feel the butterflies, I will be excited. I cannot wait to get going because it’s the biggest stage. The post Fergie Joins Man U To Face Barca appeared first on DailyGuide Network. '84 Substitutions for Ghana. Jordan Ayew on for Yiadom while @iamdavidaccam replaces @F_Acheampong. '76 Good chance for Ghana but Yiadom's strike hit the goal post with goalkeeper Yirango well beaten. '70 Ghana 1-1 Mali. Bakary Sako scores after converting a penalty. A Malian was fouled in the box. '67 Substitution for Mali. Goalkeeper Soumaila is injured after clashing with Yiadom. Ali Yirango takes his place. '66 SUBSTITUTIONS for @ghanafaofficial. @WakasoBobby comes on for @AyewAndre & @kwes1appiah on for @ChristianAtsu20. '55 SUBSTITUTION for @ghanafaofficial : John Boye who suffered a knock moments ago has been replaced by Edwin Gyimah. Boye limped out. '36 @RabiuMomo is booked for fouling an opponent in around the centre area. The Malians are growing in confidence. '7 2nd corner kick to the Black Stars. '5 Black Stars showing early promise with a lot of attacking display in the opening exchanges against #Mali. Pitch invader stirs it up and ref stops the game. 84' GOAAAAL: Senegal 2-1 Ghana. Substitute Yiadom scores for @ghanafaofficial after nicely heading in a cross. 80' SUBSTITUTIONS for @ghanafaofficial. Atsu out for Asante, Appiah out for Yiadom and Wakaso makes way for Rabiu. '76 GOAAAAL: Senegal 2-0 Ghana. Konate scores from a swift counter-attack after luring #BlackStars out of their area. 66' GOAAAAAAL. Substitute Konate takes advantage of a defensive mix up to give Senegal the lead after lobbing the ball over Brimah. 65' SUBSTITUTIONS FOR @ghanafaofficial. @Jeffrey_Schlupp comes on Acheampong. Badu on Acquah. 63' 5,466 fans in attendance today. The Senegalese fans dominate the crowd here but some @ghanafaofficial fans are here too. 62' @AyewAndre looks to have suffered another knock. He will continue the game though. 60' Demba BA makes way for Moussa Konate. 46' Substitution for Senegal. Moussa Sow makes way for Pape Kouly Diop. '45 Two minutes additional time by the ref. '23. Corner kick for Senegal as John Boye clears away the danger. So far @ghanafaofficial is the most dangerous of the two sides.